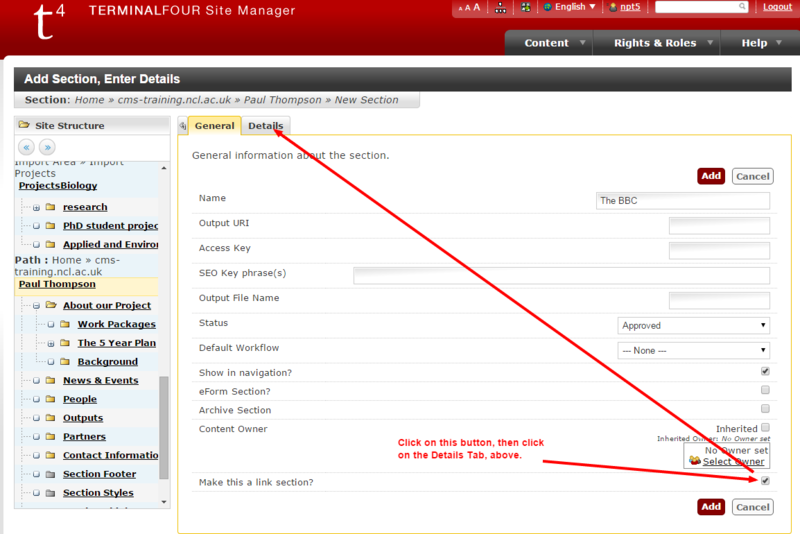 When you add a new Section to a site in T4 it automatically creates an item in the navigation or sidebar. Sometimes though, you want an item to appear in these areas that links to a different section in the site (such as back to the homepage) or to a different webpage. 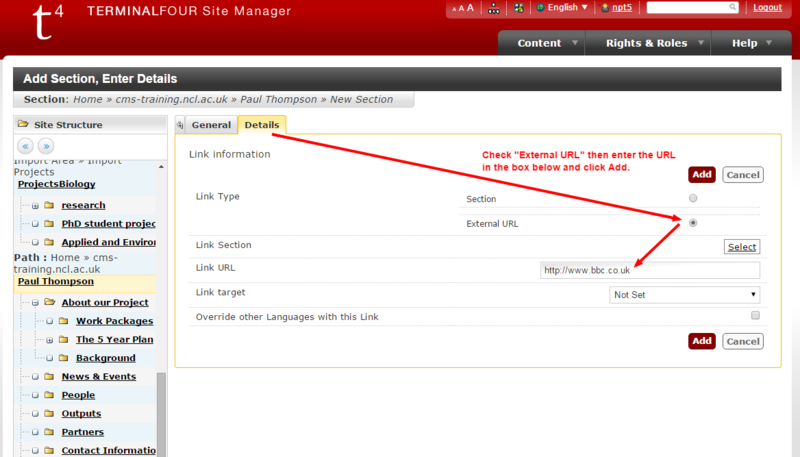 To do this you go to Add Section (as though you were going to add a new page) but instead of adding content, make it a Link Section. 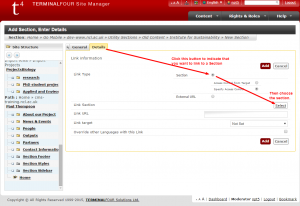 Adding a link to the Home Page. Name the section “Home”, then click on “Make this a Link Section” – at which point a tab called “Details” will appear. 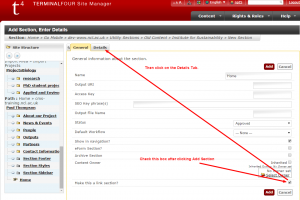 Then select the “Section” radio button followed by “Select” to choose the section you’re linking the homepage of your site. You’ll then see the “Home” section in your site, at the bottom of the section list. To re-order the tabs see this post. 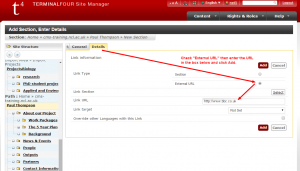 Adding a link to an External Website. 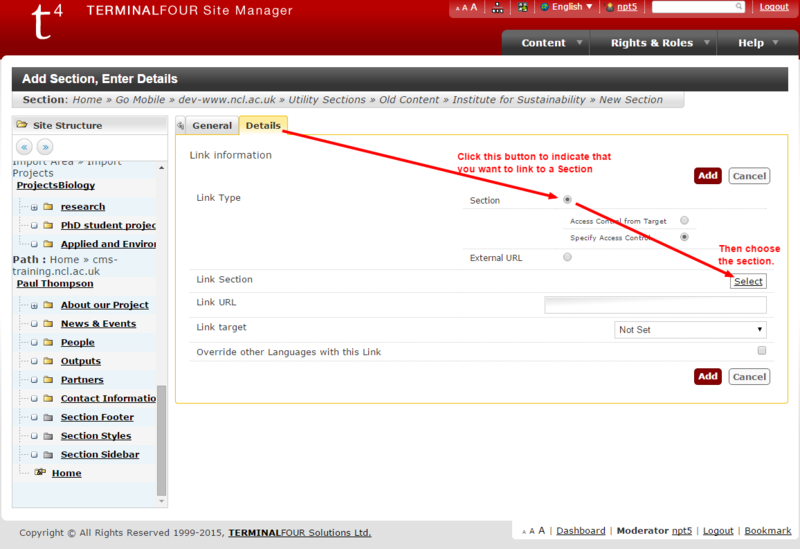 Select “External URL” then enter the address into the Link URL field and click Add. And you’re done. It will appear as a Section icon with an arrow in it that will appear in the navigation or sidebar, and when clicked on will link to an external section. Note that there is some bad practice here: people don’t expect to be take out of a site by its own navigation, so you may wish to consider instead creating a page describing the external resource and its relevance to your site and linking to it from within that page. 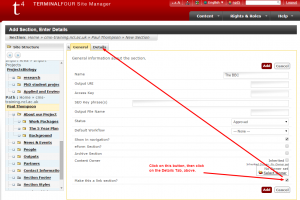 This entry was posted in Getting Started by Paul. Bookmark the permalink.